It’s August, and well that means summer vacation. August is a time when most Italians go on holiday, so when in Rome (or Milan in our case)….do as the Romans do…and go on holiday. We just returned from four days in the Dolomiti mountains, near the Austrian border, where it rained quite a bit, but the fresh mountain air was lovely nonetheless and we were lucky to be able to stay in a beautiful four and a half star hotel and enjoy their facilities, including spa treatments, indoor/outdoor swimming pool, sauna and steam room. Rest and relaxation at its best. They were even able to accommodate my diet with custom creations that included quinoa, seitan, grilled tofu, barley salad, an apple ginger soup that I must try to recreate very soon, and even oatmeal and house made sugar-free jam for breakfast. I highly recommend it if you’re ever planning a trip to the northern mountain regions of Italy. We’re now back in Milan and getting ready for a 10 day stay at the family home on the Tuscan coast, on the Tyrrhenian Sea. Days at the beach are lovely, but finding healthy food is a challenge to say the least. Most beach side cafe menus are limited to panini loaded with cured meats and/or cheese, gelato and french fries. 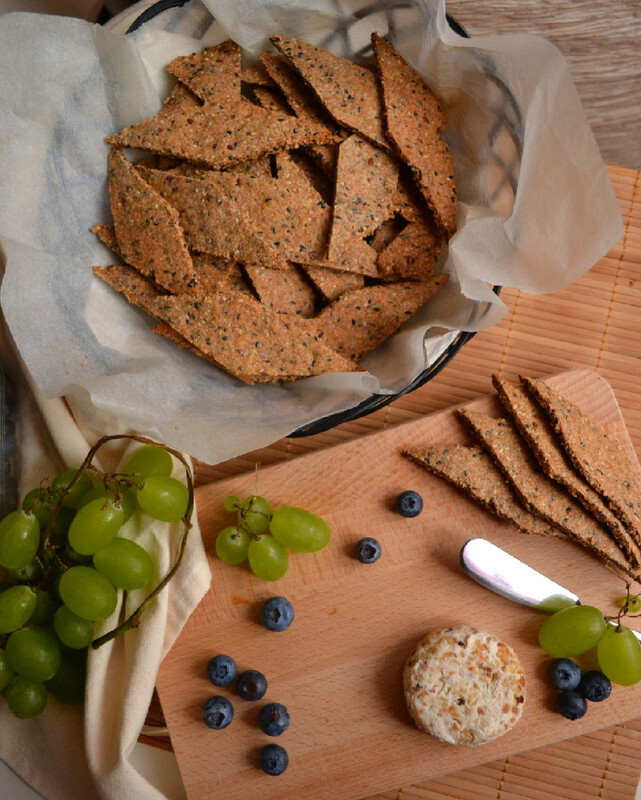 So, in preparation, I’m making some dips, spreads and pates to bring with us, in addition to these fabulous crackers and cashew cheese that we can enjoy with fresh fruit on the beach. For the crackers, I came across some sprouted wheat flour at our local organic supermarket, so I made the investment (12 euros for a 1 kg bag!!!) and put it to the test and the results were stupendous. Hubby even said we could stop buying bread all together if I could ensure we always had a supply of these crackers in the apartment. 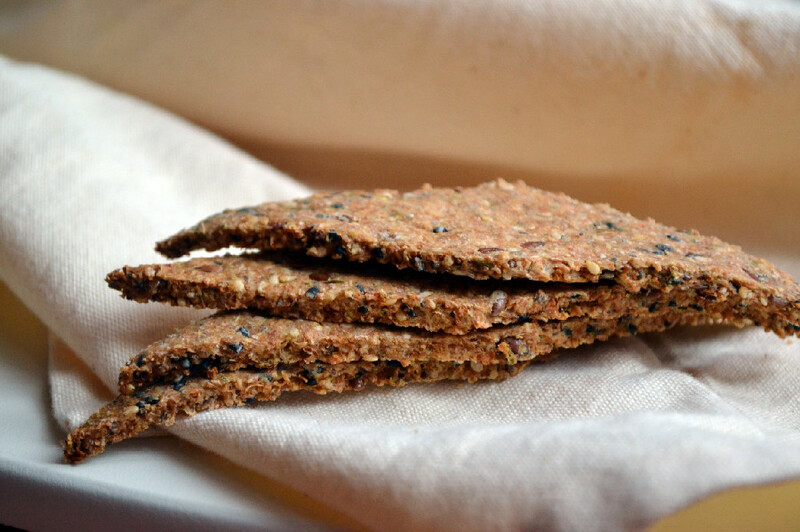 Sprouted flour is made from spouting the grain then milling it to a flour consistency. It enhances the vitamin and mineral content, reduces enzyme inhibitors for better nutrient absorption and makes the flour much easier to digest since your body recognizes it as a plant source and treats it like a vegetable. It’s also lower in gluten (but not gluten free). I’d love to one day sprout and mill my own flour, but until then, this store bought sprouted flour will do just fine. Here’s the cracker recipe. Scroll all the way to the bottom for the Cashew Cheese recipe. 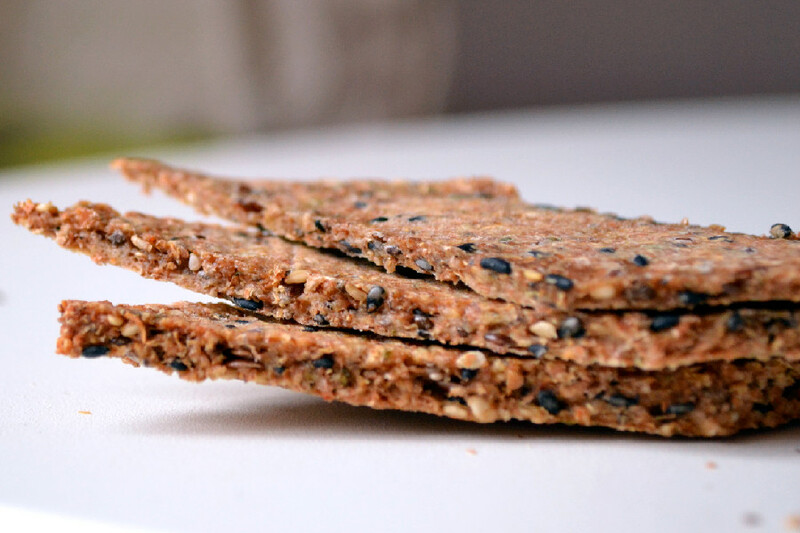 These crackers are made with sprouted wheat flour and loaded with the goodness of super seeds like sesame, flax, and chia, and seasoned with dried thyme, garlic and paprika. Change things up by adding your favourite herbs, seasonings and seeds or split the batch in two to make two flavours. Add oil, then water 1/4 cup at a time, and mix to combine until you can form a large ball of dough with your hands. It should be slightly damp, but not wet and sticky. You should be able to handle it with your bare hands without the need for extra flour. Divide the dough into two or three equal size balls, depending on the size of your tray. Use a rolling pin to roll the ball directly onto the parchment paper lined tray, to desired thickness (see tips below). Use a knife, pizza roller or cookie cutter to cut the dough into desired shape. Bake for 15 minutes. Remove from the oven, separate, turn over and bake for an additional 10 minutes (see tips below). Repeat steps 5-7 for the remaining balls of dough. Serve with your favourite spread or cheese or as a substitute for bread to accompany a meal. Amount of water may vary depending on the absorbency of your sprouted grain flour, so add water 1/4 cup at a time until you get the desired result. Baking times will vary by oven and depending on the thickness of the dough (see photo). 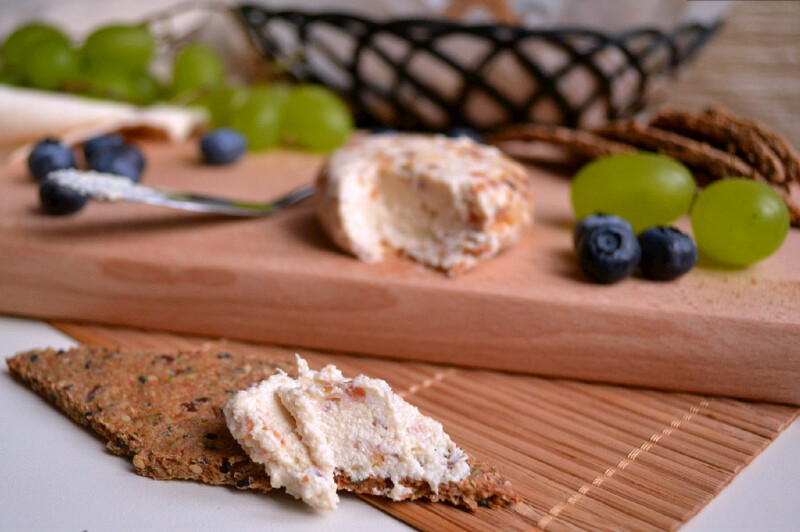 This creamy cashew cheese is a perfect spread for crackers, toast, fresh bread or as a dip for veggies. Cashews are soaked overnight then pureed to a smooth and creamy consistency, and seasoned with fresh or dried herbs and rolled in crushed nuts to create a cheese reminiscent of goat cheese. This particular version is made with dried thyme and roasted hazelnuts, but the possibilities are endless as you can use dill, oregano, basil, tarragon, pistachios, walnuts, or other herbs and nuts of your choice. Add first 7 ingredients to a high speed blender and process until smooth and creamy, without any chunks and lumps. Transfer to a bowl and refrigerate at least one hour. The flavour and texture are best if left overnight. Transfer half the spread on to a piece of parchment paper, sprinkle with hazelnuts and roll it around, using the parchment paper to create a 1 inch high puck. Repeat step 3 with other half of spread (you can use different herbs and seasonings and a different nut for each block/puck to make things interesting, it’s really a blank canvas). Place in the refrigerator to firm up for at least 20 minutes before serving. Spread over crackers, toasts or serve as a dip for veggies. Oh my word, this looks soooo good! I love both the crackers and the cheese. I’m printing this out. I have never seen sprouted wheat though and am gluten-free. Maybe I’ll try oat flour or something. I’m really loving this cheese and am eager to try it with the spices you chose! 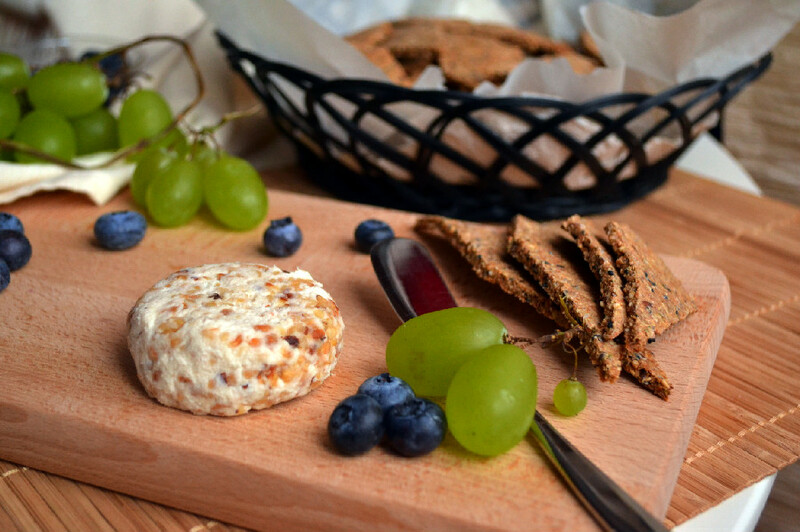 I absolutely love making cashew cheese and do it often. I love your addition of the hazelnuts! You are so sweet! Please let me know what you think if you try it out. I think any kind of flour will work for the crackers, you just might have to adjust the amount of water. For the: Umeboshi Plum Vinegar – can you sub other vinegars? Hi Julie, Ume vinegar is quite unique. It’s salty, sour and has great medicinal properties which aid in digestion, so it really adds a nice depth of flavour to the cheese, not to mention making it easier on the body since nuts in raw form can be hard on the digestive system. Its really worth keeping around and even makes a great condiment for veggies. That said, if you can’t find it, you could try it without then taste and adjust the salt and lemon to compensate if needed. I’d love to hear your feedback once you try it. How long do you thinks the cheese will keep in the fridge? Hi Nancy, the longest mine has ever lasted is 10 days refrigerated in an airtight container. I always eat it before it goes bad so I’m not sure if it could go longer. Trust your instinct, if it starts to smell/taste off, toss it. 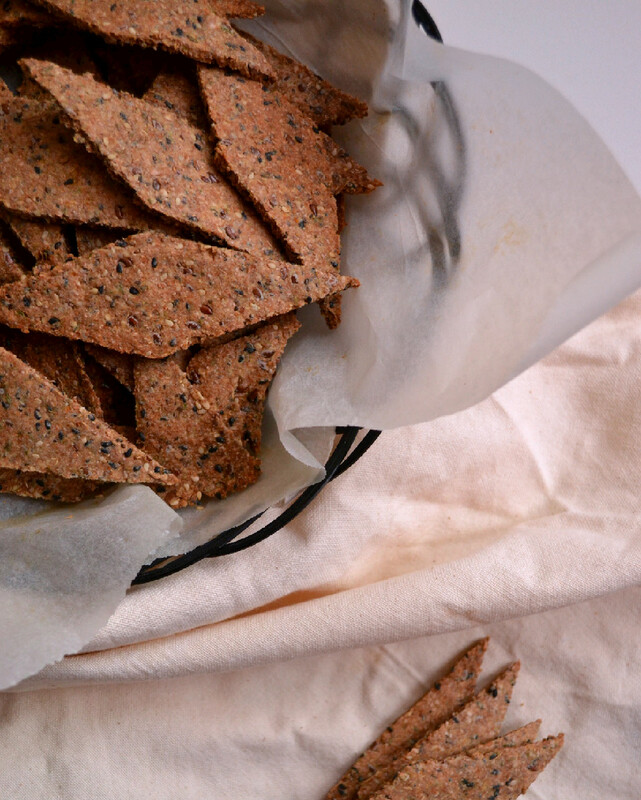 These recipes look and sound great, however, I was thinking to make the crackers in my dehydrator. Would that work ok? Not sure I have ever seen Umeboshi Plum Vinegar in my travels, so might have to leave that out. Hi Carolyn, I’m sorry I don’t own a hydrator so I’ve never tried that method, but I don’t see why it wouldn’t work. If you try it, please do come back and let me know how they turned out so other readers can benefit. Ume vinegar adds a salty sour flavour, so you can always adjust the salt and lemon juice content without it. However, it also has healing benefits that aid in digestion. It can be found in Japanese supermarkets with the soy sauce and rice vinegar, if you decide you seek it out. Thank you Audrey. These recipes are two of my prized possessions…lol.